Mechanic is one of the three starting classes a player can choose: Mechanic, Engineer, Scientist. 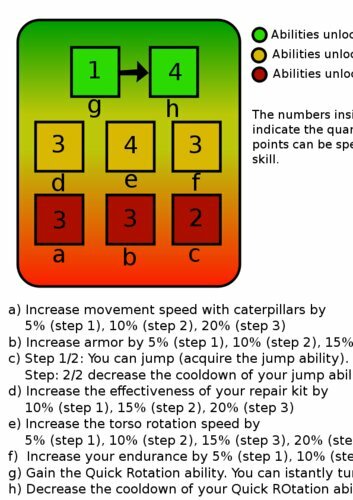 A Mechanic uses his knowledge to build solid Co.R.s that can Jump or use caterpillar to move. This is the the abilities tree I designed for the Mechanic (Click on the image to enlarge). Every three levels the player gains a knowledge point to use in this tree. Total points to gain: 15.